From Meir H. Kryger, MD, the editor of the definitive resource in sleep, Principles and Practice of Sleep Medicine, comes the Atlas of Clinical Sleep Medicine. This highly illustrated atlas provides you with an exceptional visual aid to the most comprehensive, authoritative, and up-to-date information for diagnosing and treating adult and pediatric patients with sleep disorders. 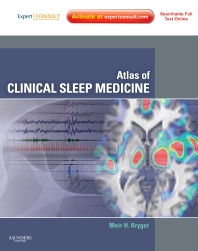 It is the first atlas that uses the new scoring rules, and reviews how to use the new AASM scoring manual that helps you score, interpret, and diagnose sleep disorders. Each chapter details the physiologic, clinical, morphologic, and investigational aspects of the full range of sleep disorders you encounter in everyday practice. Clinical information is presented in an easy-to-understand style, and the integration of color offers increased visual guidance. Plus, with Expert Consult functionality, you’ll have easy access to the full text online, as well as all of the book’s illustrations, more than 20 videos of patient interviews, over 40 sleep lab videos, and 200 plus polysomnogram fragments at expertconsult.com. Includes access to the full-text online at expertconsult.com, as well as all of the book’s illustrations, more than 20 videos of patient interviews, including narcolepsy and restless leg syndrome, over 40 sleep lab videos, including obstructive sleep apnea and respiratory diseases, and 200 plus polysomnogram fragments. Uses the new scoring rules, and reviews how to use the new AASM scoring manual that helps you score, interpret, and diagnose sleep disorders. Covers the full range of sleep disorders so you can diagnose any condition you see. Features discussions of pediatric conditions such as pediatric congenital diseases so you can better diagnose and treat this special group. Contains a wealth of high-quality polysomnograms taken from the latest machines used by institutions around the world. Emphasizes pharmacology and includes information about the latest drugs available as well as those in clinical trials to help you determine the best and most up-to-date drug therapy. Uses images and drawings to effectively describe the physiology of sleep medicine to help make difficult concepts easier to grasp. Offers a full-color compendium that combines the physiology of sleep with the relevant findings to present a complete picture of how sleep affects each body system. Uses a consistent, easy-to-follow chapter format that makes reference easy.